Aboriginal Music Manitoba continues to highlight incredible Indigenous music and performance at the 8th annual Aboriginal Music Week. This year, the festival expects more than 9,000 people to attend, which would make it AMW's biggest turnout to date. Packed with block parties, concerts, networking events, youth workshops, picnics, and lunch hour shows, AMW continues to do what it does best: build community and support great music. The week officially begins with a sweat lodge ceremony for visiting artists, local performers, and festival producers on August 8th, and AMW's public programming kicks off August 9th with the first of four free, lunch hour concerts at the Winnipeg Art Gallery's Rooftop Sculpture Garden. The lunch hour concerts, presented by Digital Drum, will feature performances by Maliseet operatic singer Jeremy Dutcher, Pitjantjatjara singer/songwriter Frank Yamma, Metis neo-soul singer David Morin, and Cree hip hop emcee Eekwol. JUNO Award-winning artists Boogat and Digging Roots are on board for performances at the Ka Ni Kanichihk Block Party presented by NCI FM on August 9th. RPM will also be partnering with Aboriginal Music Week again this year. We will be presenting the Spence Neighbourhood Block Party on August 1oth, featuring performances by Digging Roots, Frank Yamma, Jeremy Dutcher, Boogey The Beat, and Rylee Sandberg. Tracy Bone will headline the Turtle Island Block Party presented by Teekca's Aboriginal Boutique on August 11; Jade Turner, Ila Barker, and Ashley Robertson will anchor the AMW Stage presented by NOW Country at Austin Street Festival on August 12; and, country music legend Ray St. Germain will entertain audiences at the AMW Stage presented by TD at Picnic in the Park on August 13. The evenings of August 10 and 11 will be dedicate to community building for the performers and MuchFACT and TD are sponsoring networking dinners to give the artists a chance to connect, build business relationships, and discuss the future of Aboriginal music. The Open Mic presented by MB Live on August 12, which is open to the public, will give the group a third opportunity to build rapport and extend their networks to include the local music community. This year's festival looks to be another expression of #IndigenousExcellence and a highlight of an already packed summer of Indigenous music culture. Visit aboriginalmusicweek.ca for more information about the festival and keep updated at RPM.fm for more AMW content in the coming weeks. Songs in the Key of Cree will showcase the musical achievements and unique wit of the multi-talented Cree playwright, author, storyteller and musician Tomson Highway. A master pianist, composer and songwriter with a repertoire spanning three decades, Tomson Highway’s music takes inspiration from a wide range of styles, including country, Brazilian samba, jazz and French Canadian folk songs with influences of Cole Porter and Kurt Weill. In addition to his Order of Canada, the JUNO-nominated performer was named one of the 100 most important people in Canadian history by Maclean’s magazine. And that's just a sampling of the accolades and experience Highway has collected in his life and work so far, while he has criss-crossed the world conducting lectures, readings and musical performances. It's no wonder the SPEAKeasy Collective has produced a night to celebrate him. Songs in the Key of Cree, a one-time musical tribute to Highway, will take the stage for two nights at Hugh's Room in Toronto, Ontario. The retrospective will include performances by Highway with musical director and pianist John Alcorn, saxophonist Marcus Ali, and performers Micah Barnes, Laura Hubert, Teresa Castonguay, Jani Lauzon and Patricia Cano. This month we are co-presenting two hot nights of Indigenous music at Toronto's Gardiner Museum! The concerts are part of the programming around the current Kent Monkman exhibit and we're thrilled to be part of the mix. Kent Monkman’s site specific installation at the Gardiner Museum in Toronto, Ontario, entitled The Rise and Fall of Civilization includes a nine-foot cliff structure, taxidermied bison, a statue of Monkman’s two-spirited, trickster alter ego, Miss Chief, and artistically it sits in direct contention with Picasso, primitivism, and modernism. And in conjunction with this presentation, the Gardiner has a series of related programming including these two nights of Indigenous music that we were stoked to curate. Friday November 7th, you'll see Irish-Ojibwe outlaw-country singer-songwriter Sean Conway and Métis folk/roots singer-songwriter Amanda Rheaume. Both artists will have their bands in tow and RPM's own Jarrett Martineau will host the night. Friday November 13th, join us for intimate, solo performances by Six Nations bluesy, passionate artist Logan Staats and Cree folk/roots singer-songwriter Christa Couture. These concerts are free with half price admission into the Gardiner and start at 7pm both nights! Come early to explore Kent's work and the rest of what the museum has to offer. See you there, Toronto! Aboriginal Music week is here! 35 acts from Turtle Island and beyond take to stages throughout Winnipeg. Now in it's seventh year, Aboriginal Music Week continues to bring the hottest Indigenous talent together in Winnipeg, Manitoba, for five days of non-stop events. Check out the full schedule here and enjoy! And don't forget to join us for our closing night party on Saturday, August 22nd. See below for details. RPM and Aboriginal Music Week are joining forces for an epic closing night party this year. Check our exclusive AMW Mixtape to get a taste of what's to come. We enlisted the talent of rising Anishinaabe hip-hop producer and DJ Boogey the Beat to compile sounds from this year's AMW artists and it's the perfect soundtrack for #MixtapeMonday. Bringing together hip-hop and R&B tracks from all of our closing night party performers including—Hellnback, Mariame, T-Rhyme, and Tall Paul—as well as the eclectic electronics of Exquisite Ghost, the rap stylings of Mic Jordan, a guest appearance by Lightning Cloud, and some of Boogey's own killer productions, this is a party rocking, beat-based excursion into the contemporary sounds of #IndigenousExcellence. And don't forget to join us for the Aboriginal Music Week Closing Night Concert on Saturday, August 22nd at The Good Will in Winnipeg, Manitoba. Tickets and info here. Nominations for Australia's 2015 National Indigenous Music Awards have been announced. Leading the pack is acclaimed Yorta Yorta hip-hop artist Briggs who is nominated in five categories, including Artist of the Year, Best Song and Best Music Video (for "Bad Apples"), Best Album and Best Cover Art (for Sheplife). Briggs took home the award for Best New Talent at last year's NIMAs. Following closely behind are singer Thelma Plum and "country soul rock 'n roll" artist Dan Sultan, who are each nominated for three awards. Plum, who's latest EP, Monsters, was one of our favourite releases of last year, is nominated for Artist of the Year, and has two songs up for Song of the Year: "How Much Does Your Love Cost?" and the soaring anthem "Young in Love". Sultan is also up for Artist of the Year, and his single "Dirty Ground" is nominated for Song of the Year and Best Music Video. We're also pleased to see the NIMAs continue their Indigenous community focus by honouring several local musical initiatives produced by Desert Pea Media and Indigenous Hip Hop Projects in collaboration with local partners and Indigenous youth. The National Indigenous Music Awards, which celebrate excellence in contemporary Indigenous music from across Australia, will be held in Darwin on July 25, 2015. RPM is proud to present an incredible night of Indigenous hip-hop, R&B, and trap music to conclude Aboriginal Music Week 2015. 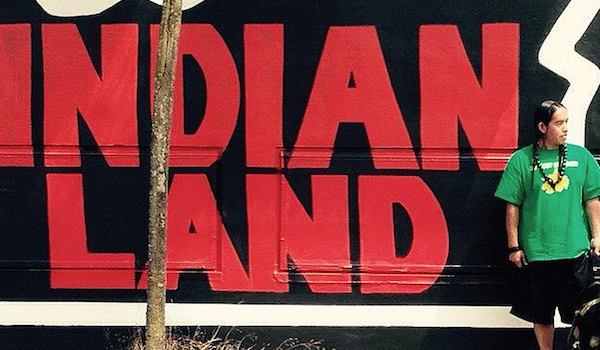 The closing night of Aboriginal Music Week is the very definition of #IndigenousExcellence. This year, RPM is partnering with AMW to bring you a concert featuring some of Indian Country's fastest rising hip-hop stars: Drezus, Mariame, Hellnback, T-Rhyme, and Boogey the Beat. An accomplished young producer with a gift for booming beats and hypnotic melodies, Anishinaabe artist Boogey the Beat will bless us with his trap-infused rhythms. N'we Jinan artist and rising Cree R&B singer, Mariame, will be joining us from Quebec to perform songs from her recently released debut EP, Bloom. And, hailing from Saskatoon by way of Edmonton, self-described femcee T-Rhyme will bring her 'ATCQ to Jean Grae'-influenced hip-hop styles to the stage. Rounding out this already incredible lineup, acclaimed Samson Cree hip-hop heavyweight and 2015 Indigenous Music Awards nominee, Hellnback, will give shine to tracks from his brand new record, F.O.E. (#FamilyOverEverything). UPDATE: Tall Paul won't be able to make it, but hot off his recent Warpath Tour, we've got Cree hip-hop artist Drezus coming through to rep for the people and give us a dose of his banging beats and Native Pride-filled lyrics. This is a closing party without compare and a showcase of what's next in native hip-hop and Indigenous music. You don't want to miss it. Aboriginal Music Week, an annual celebration of "the fact that Indigenous artists around the world are creating music that crosses almost all musical and physical borders, without regret", runs from August 18-22, 2015 in Winnipeg, Manitoba. With a full lineup of Indigenous music events including the Spence Neighbourhood Block Party, the Turtle Island Block Party, an AMW stage at the Austin Street Festival, and a daytime stage at Picnic in the Park, this year's AWM is going to have something for every listener and music fan. June 21st is National Aboriginal Day in Canada. What will you be doing to celebrate? Although we're not totally sold on the idea of the federal government designating one day a year to celebrate Indigenous culture, at least it's an opportunity to check out some amazing performances by Indigenous artists. And, as June 21st also marks the summer solstice, there are more than enough reasons to get out of the house and show your love for all things NDN, First Nations, Aboriginal, Native, Métis, Inuit, and Indigenous. There are many different events being planned across the country (here, here, and here, for example), so we were hard pressed to narrow things down. But here are eleven decidedly great ways to spend the solstice and National Aboriginal Day this year. The Métis Nation of Alberta and their affiliate organization, Métis Crossing, will be hosting a celebration for National Aboriginal Day on June 21st. Located at the Métis Crossing Historic Site (south of Smokey Lake, Alberta), between 11:00 AM and 6:00 PM, the day's events will include an open stage jam, cultural interpretation, a genealogy exhibit, games, on-site concession, and an elder’s lounge. For more info click here. Anishinaabe MC/singer/songwriter Leonard Sumner will be one of many performers taking part in the Indigenous Arts Festival at Fort York in Toronto. Fusing elements of hip-hop, country, and rhythm & blues, his music appeal cuts across age lines, allowing his style to be enjoyed by people who typically 'aren't into rap'. Sumner will be rocking the festival mainstage on Saturday, June 20th at 5:30pm. For more information, click here. Second in size only to Winnipeg's #ADL2015 celebration, Edmonton will be putting on a full day's worth of events on June 21st, culminating in a mainstage show that will feature some incredible Indigenous performers—including the idiosyncratic experimentalism of Ghostkeeper, the full-blown, blues rock of Derek Miller, and the powerful contemporary country sounds of Crystal Shawanda. Definitely worth checking out. For more about Edmonton's 9th annual Aboriginal Day celebration, click here. 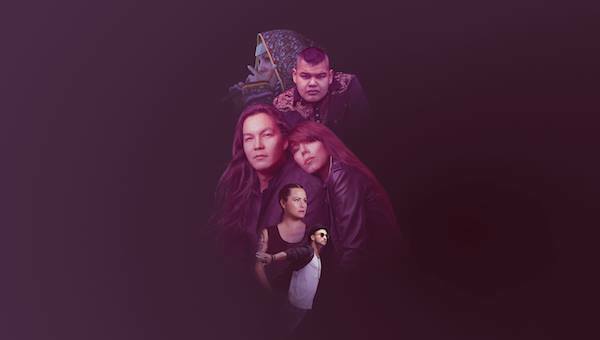 The 2015 Aboriginal Music Week is shaping up to be quite the celebration. This year, AMW and the Spence Neighbourhood Association are joining forces once again for the 3rd annual Spence Neighbourhood Block Party. The free outdoor concert will be held from 4pm-8pm on Wednesday, August 19th at the Magnus Eliason Recreation Centre in Winnipeg, Manitoba. 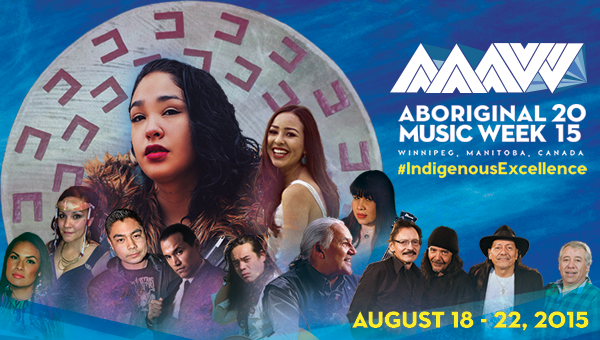 The lineup will feature some true #IndigenousExcellence from across Indian Country including singer Winston Wuttunee, Inuk throat singer Nikki Komaksiutiksak, and country/rock group Joe Maxim Band. In addition, three youth performers will also be announced in the coming weeks. Winston Wuttunee is a household name in the Canadian music industry who has wowed audiences across North America as well as Europe and Australia as a singer, keynote speaker, and comedian since 1973. Nikki Komaksiutiksak is traditional Inuit throat singer from Rankin Inlet, Nunavut who now calls Winnipeg home. Joe Maxim Band is an Aboriginal country/rock band with well over 10,000 of performance experience under their belt. Aboriginal Music Week produces concerts in neighbourhoods throughout the city in an effort to make it easier for families to walk to the venues, but music lovers from outside the neighbourhood are more than welcome to attend. Aboriginal Music Week 2015 is set for August 18 - 22 in Winnipeg, Manitoba, Canada. It will include four community celebrations at the Magnus Eliason Recreation Centre, the Turtle Island Neighbourhood Centre, the Austin Street Festival, and St. John's Park. Four lunch hour concerts, three days of music workshops, two ticketed concerts, two networking dinners, and mentor meetings with three international artists round out the festival programming this year. Stryk-9 Channels Ancestral Power in New Single and Video, "In The Spirit"
Stryk-9 represents for the people on new single and video, "In The Spirit". 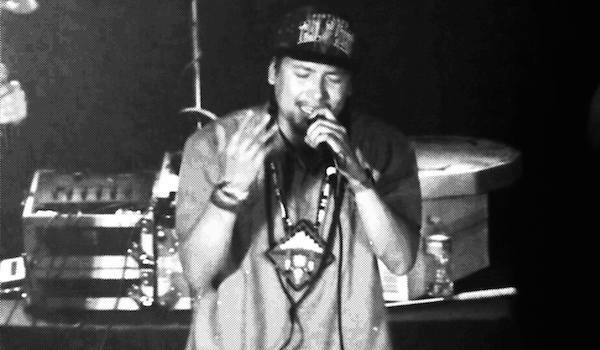 Hochunk-Northern Cheyenne hip-hop artist Kunu Dittmer—aka Stryk-9—has been at the game for years, building and creating throughout the Northwest with his Indigenous crew, the Burial Ground Sound Collective. Stryk-9's new single, "In The Spirit", is a heartfelt portrait of empowerment and Indigenous struggle that comes drumming through your speakers with the spirit of Crazy Horse. Opening with a throwback soul sample that flips a traditional hand drum song and vocal over a head-knocking hip-hop beat, Stryk-9 spits raw verses about bringing his creativity into action for clan, fam, and all relations. But as he asks in the track's closing lines, what can we do in the face of "world wars and global warming", when we're "living the story of creation / the destruction of the system that's corrupting the spirit of women and men / is it the beginning or the end?" Politically charged, but decidedly personal in its ambition to bring truth to the light for the benefit of all Indigenous Peoples, this is a revolutionary warrior's anthem for the conscious, proud, and free. Catch Stryk-9 and the Burial Ground Sound Collective, alongside Almas Fronterizas and Katrina Benally (Diné), at "Uprising at the Abbey"—an all ages, hip-hop showcase organized as part of the One Flaming Arrow Festival's closing night—Sunday, June 14 in Portland, Oregon. Full event info here. DOWNLOAD: Stryk-9's - "In The Spirit"
Watch Stryk-9's "In The Spirit"
The One Flaming Arrow Festival of Indigenous art, music, and performance blazes on. Kicking off last week in Portland, Oregon, the inaugural One Flaming Arrow Festival is bringing an incredible array of contemporary Indigenous art, music, readings, film screenings, panels, performances, and concerts to the Indigenous lands of the Chinook/Multnomah peoples. The brainchild of Demian DinéYazhi, Kaila Farrell-Smith (both of R.I.S.E. ), and Carlee Smith, One Flaming Arrow launched a successful crowdfunding campaign this winter to bring together radical Indigenous voices from across Native america for a 12-day celebration of contemporary Indigenous arts. In between the low-rider bike workshops, storytelling sessions, art installations, poetry performances, and an Indigenous Futurisms film night curated by Grace Dillon, the festival is also showcasing some of the finest in Indigenous music culture. On Tuesday, June 9th, Diné experimental/noise musician Raven Chacon (of Postcommodity), White Mountain Apache violinist Laura Ortman, and the Diné electro-queerpostpunk duo Discotays will throw down at the Holocene. Event info is below. The One Flaming Arrow Festival continues through June 14th. Check the festival program for the full schedule of events. One Flaming Arrow offers stark and powerful evidence of the Indigenous artists at the forefront of the contemporary creative arts. May this year be the first of many to come. JUNE 9th: Laura Ortman & Raven Chacon Performance and the Discotays at the Holocene! 9:30pm-11:30pm Holocene: 1001 SE Morrison, Portland 97214 Join us on June 9th, 2015 at the Holocene in Portland, Oregon for Raven Chacon & Laura Ortman + Discotays. We have the honor of showcasing two award-winning multi-instrumentalists, Indigenous composers Raven Chacon & Laura Ortman along with the musical styling of Discotrays. DISCOTAYS (Diné) are a music duo from Navajo Nation, comprised of artists Hansen Ashley & Brad Charles. Their music has been adored by the likes of Kathleen Hanna and can be described as post-punk electro & queerpostpunk / queerpostsurf / queernowave. Laura Ortman (White Mountain Apache) has performed with Stars Like Fleas, the Dust Dive & Silver Summit, & composes music for art installations & films in the form of the Dust Dive Flash. She plays violin, Apache violin, piano, electric guitar, musical saw & samplers. Ortman has created music for films by Martha Colburn & Indigenous filmmakers Blackhorse Lowe, Alan Michelson, & Raquel Chapa, among others. Raven Chacon (Diné/Chicano) is a chamber music composer & experimental noise artist. Chacon is a member of the Indigenous art collective, Postcommodity, with whom he has developed multi-media installations that have been exhibited internationally. Both his solo work & his work with Postcommodity has been presented at the Sydney Bienale, Kennedy Center, Adelaide International, Vancouver Art Gallery, Musée d’ art Contemporain de Montréal, The San Francisco Electronic Music Festival, Chaco Canyon, & Performance Today. Tickets are $8 in advance & $10 at the door. 21 and over. 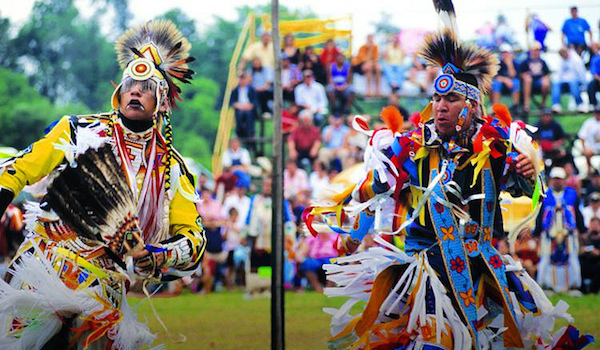 It's pow wow season once again—here's your guide to 2015 Pow Wows happening across Turtle Island. It's almost summertime and you know what that means: it's time to hit the pow wow trail and enjoy visiting, dancing, drumming, and celebrating your way across Indian Country. Our friends over at Windspeaker have put together a poster-sized calendar of upcoming pow wows for you to choose from. And, of course, PowWows.com continues to hold it down with their real-time, and recently updated calendar of events. RezX Magazine is also getting in on the action, with their own digital 2015 Pow Wow Guide. The largest pow wow on Turtle Island, Gathering of Nations, may have already happened—but the rest of Indian Country is just getting warmed up. No matter where you live, there's sure to be a pow wow nearby, so get that regalia ready, throw some gas in the truck, and we'll see you out there. Hoka! Check the calendar below for an event near you.